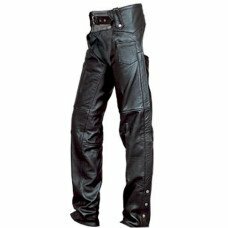 Protect your legs while cruising with a nice pair of wholesale leather chaps from CKB Products. These quality discount chaps come in a in black leather and silver hardware. CKB Products has always offered great wholesale pricing to the public. We have built our reputation on selling quality wholesale leather chaps to the public at prices way below retail. Buy CKB and start saving today. As low as: $35.10 each.